A bright reminder of the brotherhood of peoples and nations that have joined their efforts to battle fascism – a ceremonial meeting at the Mira (Peace) square became the central event in the celebration of the 75th anniversary of arrival of the first Allied convoy Dervish to Arkhangelsk. Just some minutes before the ceremony the RF Northern Fleet Commander finished the round check of the vessels at anchorage on the Northern Dvina river. Corvettes ASWs and a submarine came to the exact same place that 75 years ago was taken by the ships of the first convoy codenamed Dervish. A multitudinous blast of the ships’ whistles became a special prologue to the ceremonial meeting. Over 300 ships and vessels across Russia gave a simultaneous greeting to the Krasin icebreaker – a participant of the Arctic convoys that is now permanently anchored in Saint-Petersburg. A wave of memory as vibrant as the ships’ whistle blast is moving across the country these days. The wave of honouring the Arctic convoys veterans. People who were stronger than the ice, the storms, enemy torpedoes, and bombs. Arkhangelsk is by right the center of the celebration. It is here that in the turbulent August 1941 the first Allied convoy brought vital goods. The convoy travelled by sea literally through ice and fire. Ships flying different flags formed a convoy and worked together for the common goal. - The Arctic convoys have become a symbol of incredible perseverance in battles, - Igor Orlov, the Governor of the Arkhangelsk region, emphasized in his ceremonial speech. – They became a proof of the fact that only through joining our efforts can we achieve peace and freedom. We have won because we stood for our rights for the peaceful sky. Traditions of the Arctic convoys are sacredly preserved by the Northern Fleet, said the Northern Fleet Commander Vice-Admiral Nikolay Evmenov. - For us convoys are nor just dots on the map that show the location of the ships' heroic deeds. It is memory in our hearts, - he said. The ships in convoys flew flags of many different countries but the first convoy that came to Arkhangelsk was made of the British ships. - The Arctic convoys played a crucial role in the victory over Nazism, - said the Princess Royal in her speech. - It was a hazardous journey. It is important that we continue to honour their heroic deeds, and pay tribute to their sacrifice. The scale of the loss felt by the Soviet Union during the Second World War will not be forgotten by the UK. The Princess Royal also expressed her gratitude to the organisers of the commemorations, and to all Russian people for the generousity they have shown to the British veterans. All diplomatic missions expressed their warm and sincere greetings. Heroic acts of veterans were acknowledged by the Ambassador of Canada to the Russian Federation Mr John Kur, Ambassador of Australia to the Russian Federation Mr Peter Tesch, Naval Attaché of the French Defence Mission Mr Cyrille Gloaguen, Consulate General of the Netherlands in Saint-Petersburg Mr Hans Wesseling, Ambassador of New Zealand to the Russian Federation Mr Ian Hill, head of the Iceland delegation Mr Magnús Þór Hafsteinsson, temporary Charge d’Affairs of the Embassy of Poland to the Russian Federation Mr Mirosław Cieślik, and the Consul General of the United States of America to the Russian Federation Mr Thomas Leary. All diplomats noted the kindness of the northern people and their warm welcome, and thanked them for preserving the memories of the Arctic convoys. Silence comes to the Mira square, silence of a special nature. A minute of silence paid tribute to the memory of all those who never returned back home, who didn’t make it to the present day. 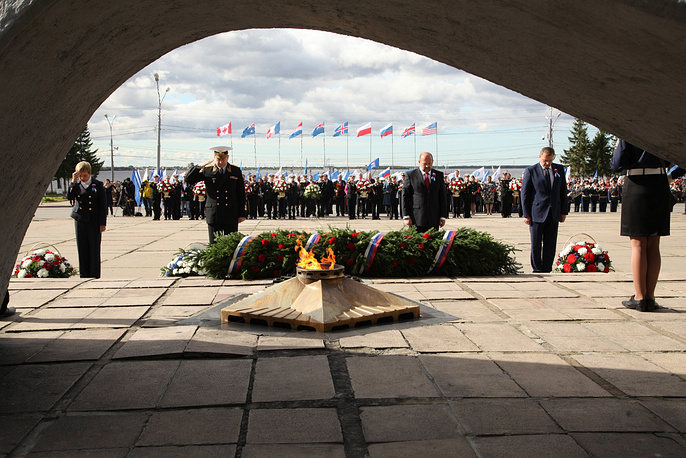 The ceremonial meeting closed with a solemn wreath-laying ceremony at the Eternal Flame. After the official part the Princess Royal, Governor Igor Orlov, and other meeting participants had informal conversations with the honorable guests, the main participants of the festive events - the veterans of the Arctic convoys. 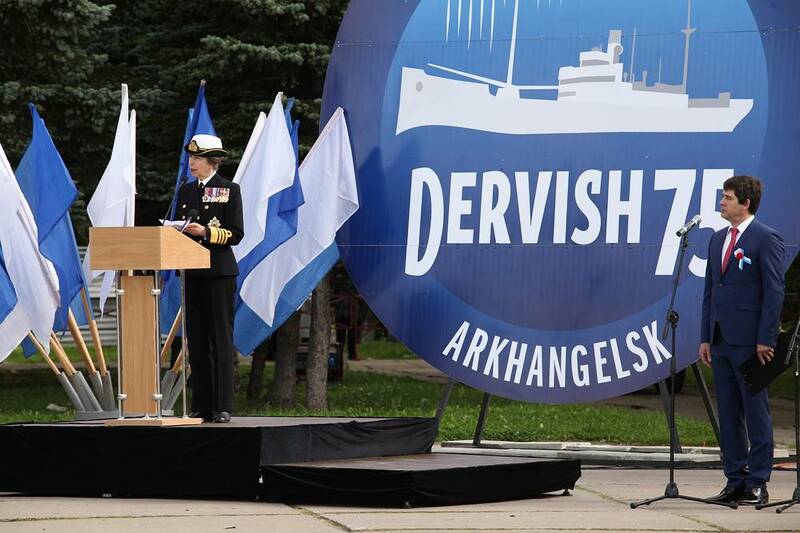 The festive events dedicated to the 75th anniversary of arrival of the first Allied convoy Dervish continue.